The mall is dying — but Apple's retail chief Angela Ahrendts is reimagining the company's stores anyway. It's 11:30 p.m. on a Thursday, and Silicon Valley has gone quiet for the night. The streets are largely empty, the corporate campuses dark. But in a sea of vacant office parks, the lights are on in a squat and entirely unnoteworthy building in Sunnyvale, California — and the parking lot is packed full. Inside, scores of Apple engineers are huddled around, chattering about server loads. A collection of monitors is mounted on the wall, flashing charts, numbers, and graphs. Preorders for Apple's newly announced iPhone 8 are about to begin, and this is the company's "war room" — mission control for a massive one-night retail operation that sees a deluge of sales. Everyone is dressed comfortably for an all-nighter, yellow security bands on their wrists — everyone, that is, except Angela Ahrendts, Apple’s senior vice president of retail. She’s running the show. Three years ago, Apple spent more than $73 million, mostly in stock, to convince Ahrendts to leave London, where she was CEO of the luxury fashion company Burberry, and move to Silicon Valley to head Apple’s online and physical retail presence. Retail is central to Apple’s strategy: Apple Stores have greater sales per square foot than any other retailer in the world, including jewelry stores and car dealerships. In 2017, each square foot of Apple Store real estate translated to $5,546 in annual sales. At the store, Apple products don’t have to share shelf space with competitors; the company can fully control the customer experience; and patrons can be enticed beyond the iPhone into buying iPads, laptops, and other, more expensive items gleaming on the store floor. CEO Tim Cook has long wanted Apple Stores to be a place for more than browsing new Apple gadgets and fixing broken ones. But retail is in trouble. Chains are cutting jobs and closing stores en masse as more and more shoppers turn to online outlets like Amazon. In 2015, only 11% of US customers bought an iPhone — the company’s best-selling product and the source of over half of its revenue — from Apple. Rather, most buy them from their telecom carriers, many of which offer low-cost leasing deals bundled with cellular plans. And the majority of people who do buy directly from Apple do it online. In fact, the only other e-commerce website that generates more in sales revenue than Apple.com is Amazon. CEO Tim Cook has long wanted Apple Stores to be a place for more than browsing new Apple gadgets and fixing broken ones. Ahrendts is charged with fulfilling that vision. One of her first projects was increasing the web store’s synergy with its physical counterpart by introducing measures like being able to order a product online and pick it up in-store the same day, and, if a product isn’t available in-store, being able to order it online. Following her first keynote appearance, all eyes are on Ahrendts, Apple’s big investment, as she reimagines the most public-facing part of Apple: its stores. It won’t necessarily be simple. Ahrendts is often credited with turning the flailing Burberry brand around; in her seven years as CEO, she tripled the company’s market value. She is now Apple’s highest-ranking woman, in charge of about 50% of the company’s workforce: 65,000 retail employees, in addition to real estate, operations, contact center, and online store teams. Even early in her tenure at Apple, she drew attention: In 2013, Salesforce CEO Marc Benioff tweeted, “I just saw Future Apple CEO @AngelaAhrendts on her farewell Burberry tour! The most important hire Tim Cook has ever made!” (Both Cook and Ahrendts batted down "future CEO" rumors in an interview with BuzzFeed News at the recent opening of Apple’s Chicago flagship store: “Fake news … silly,” the retail chief said immediately, shaking her head. Cook, smiling, responded: “I see my role as CEO to prepare as many people as I can to be CEO, and that’s what I’m doing.”) She is just under six feet tall, and she could easily be seen as intimidating. But in fact, she’s warm and accessible — the kind of person who shakes your hand with two hands. Like other high-ranking Apple executives, Ahrendts often shows up at retail stores unannounced. A few days before the new iPhone launch, BuzzFeed News was invited to tag along on a visit to Ahrendts’s “hometown” store. The executive strolled into a recently remodeled location in Indianapolis’s Fashion Mall at Keystone — just 30 minutes from New Palestine, where she grew up — and was greeted with hugs and a round of applause. In a different life, Ahrendts could have been a pastor. After her surprise entrance, she motioned for retail staff to take a seat on the many leather-and-wood cubes arranged on the floor (designed, like many of the store’s wares, by chief creative Jony Ive). “You will have more and more AirPods, I promise! I know customers can’t get enough,” Ahrendts said to the group. Everyone laughed. As she often does during store visits, Ahrendts took over the morning meeting, before the store’s doors opened at 10 a.m. The topic? The responsibility of retail during a critical time for Apple: the annual fall iPhone launch. “Online preorder, that’s all wonderful,” she said. “But you are the physical, right? This is the human connection I talked about at the keynote. That’s what they’ll never be able to get online. That’s your gift.” The small army of navy-clad Apple employees nodded. Architect Stefan Behling (center left) and Ahrendts speak to guests during a previews of Apple's newest store along the Chicago River on Oct. 19, 2017. To tens of thousands of Apple retail employees around the world, Ahrendts is a familiar face. She publishes weekly YouTube-style videos featuring “three thoughts in three minutes or less” (to “get everybody united and focused,” she says). But for many outside of the company, the retail chief was relatively unknown before she spoke at Apple’s September keynote to tout a plan to build elaborate new retail locations around the world. Among these new stores: a luxurious five-story atrium on Paris’s Champs-Élysées and a semiunderground building set beneath an outdoor amphitheater in Milan (with a waterfall entrance!). Except they’re not stores. A rendering of Apple's upcoming Milan location. But while the terminology landed poorly for some, Ahrendts and Apple may need to lean on the grandiose if they are to turn a sales floor into a place you want to hang out at in a bleak retail landscape. This year, Toys ‘R’ Us, RadioShack, and a dozen others filed for bankruptcy and closed a number of locations, as more and more consumers turn to online storefronts to shop. As a result, retailers are embracing the “experience” model: Nordstrom is testing a concept store that won’t have any clothing in stock, but rather fashion stylists on hand to dole out advice, along with cold-pressed juice and coffee available for purchase. Ahrendts-era Apple stores are commerce engines, expertly designed to sell you a $1,000 iPhone in a beautiful glass dome anyone can walk into. “It used to be that 80/20 rule — [malls] would be 80% shopping and 20% experience. It’s got to go the opposite now, because all the shopping you can do faster, cheaper, etc., online,” Ahrendts said in a May 2017 interview with LinkedIn. 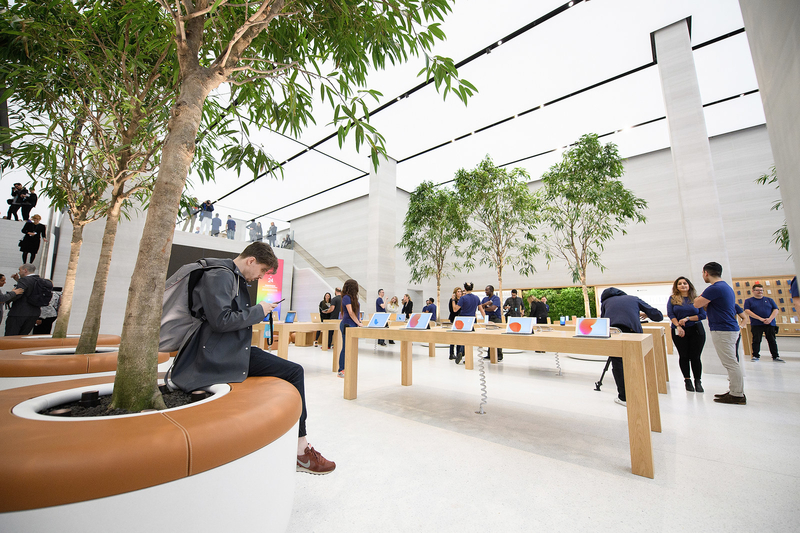 By adding communal features (including free Wi-Fi and outdoor tables) and offering classes (that extol the features of Macs and iOS devices), Ahrendts is hoping to persuade customers to spend more time in Apple Stores. Maybe they’ll even want to buy something. You can now go to the Apple Store to learn how to code in a schmancy new theater, or watch a performance by an Apple Music–featured singer-songwriter, or sit under a tree with a Genius to figure out why your iPhone doesn’t charge anymore, or watch as an illustrator doodles live (on, of course, an iPad). Ahrendts-era Apple Stores are commerce engines, expertly designed to sell you a $1,000 iPhone (made more affordable with a $50-per-month interest-free leasing plan!) in a beautiful glass dome anyone can walk into. 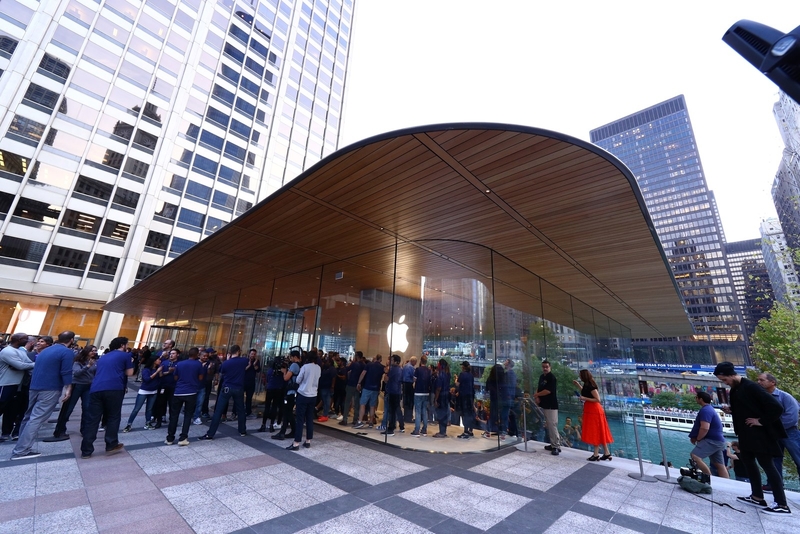 Left: Apple's new store in Chicago. Right: An interior view of a new retail store in London. So stores have the same wooden tables and stools used in the company’s design workspaces, along with the same terrazzo floor as the lobby of the just-opened Steve Jobs Theater at Apple’s massive new Cupertino headquarters. They’re dotted with trees, inside and out. They feature giant glass doors, the obsessively secretive company’s play on transparency: “We came up with new door concepts … to be totally transparent, so you could really become one with the community that you're in or become one with the city,” she said. And like any Apple product, the stores are deeply considered, down to the sidewalk cracks. “I’m a brand purist,” Ahrendts told BuzzFeed News. Ahrendts’s approach to retail harkens back to the late founder Steve Jobs’ insistence on building “the whole widget” — in other words, constructing the look and feel of a device, as well as making the operating system and the processor that runs it, in order to fully optimize — and control — the entire user experience. “This is our hardware,” she said, pointing to the Indianapolis store’s glass doors and indoor ficuses. ”Then you say, ‘What’s the software of the store? How do we turn it on?’ Because this unto itself is magnificent, but it's not just what it is, it's what it does,” referring to the new Today at Apple program, under which locations host events like photography workshops and coding classes. Ahrendts also made a number of refinements to in-store service. Going to the Apple Store “shouldn’t be like going the dentist,” she said. You can now get a text message when someone at the Genius Bar is available, instead of having to wait around. That bar has also been, in some locations, refashioned into an airy “Grove” with additional seating. Updating the Genius area may be the most visible operations work Ahrendts is doing. Getting a broken iPhone, Mac, or iPad serviced remains a frustrating experience for many. Earlvin Rivera, a former Genius who spent nearly a decade at Apple, told BuzzFeed News that when Ahrendts took over retail, she changed the color of staff T-shirts — to gray, and then eventually to the current navy — and upgraded the shirt with material that was “softer to the touch” compared to the previous uniform’s “tough” fabric that faded easily. A woman uses an iPad to draw a picture of Apple founder Steve Jobs at the Apple Store on Regent Street, London. Ahrendts — and Apple — are hard at work updating 400 existing classic stores, many of which are so small that Apple originally called them “one-table” stores, because that’s all they were: a single table in the center of a room selling iPods and a few Macs. But the core of the strategy is doubling down on metropolitan areas. Ahrendts’s team conducted an extensive study of cities, looking at factors such as tourism, technology usage, and demographics, an approach taken from her roots in high-end fashion. “One of the things I took from luxury is you look at the top cities in the world; you don't just look at the countries. We did a lot of analysis, really studying the top 100 cities in the world, and not just now, but by 2020 and by 2025. Because you really need to target your investment,” she said. And so, unsurprisingly, Apple is expanding in China in a big way. According to Ahrendts, 18 of the top 100 cities she evaluated are in China, and Apple now has 41 stores in the country, most of which were opened in the last three years. Apple also didn’t have a plan for hiring and training qualified staff for all of its new locations in time. So Ahrendts, in one of her weekly videos, asked retail employees if they’d be willing to move to China. “I said, ‘If you're interested in having an adventure, it can be one year, three years, five years, whatever you'd like, but we'd love your help, and anyone interested in moving to China, please contact your talent partner,’ et cetera,” Ahrendts said. She thought she’d get 100 or 200 volunteers. “Two thousand!” she recalled. “Two thousand Apple employees called talent within the first week.” Half of those ended up moving overseas. But Apple’s strategy of investing in high-yield markets — state-of-the-art Chinese stores, an extremely fancy five-story atrium in Paris, a riverfront property in Chicago — means it’s focusing less on areas like Montana, North Dakota, South Dakota, Wyoming, Vermont, and West Virginia, states that don’t even have one Apple Store. Without retail locations nearby, those in rural areas have a more difficult time getting their devices fixed and often face long waits, since Apple doesn’t offer official parts to anyone other than its own stores or authorized service providers. Earlier this year, Apple did pledge to send its proprietary screen repair machine to 400 third-party service providers globally, which would provide more access to same-day repairs. But those providers still don’t offer the same features one would find in a full-fledged retail store. People wait outside the first Apple Store in Yunnan on Jan. 21, 2017, in Kunming, Yunnan Province, China. Furthermore, some “classic” stores that have not been remodeled are struggling to keep up with increasing foot traffic. “When we see people are excited about new tables or trees in stores, that’s beautiful. But when we’re so in demand and we feel like we’re being stretched so far... I don’t think the retail store and corporate are aligned,” said one full-time employee, who has worked in retail operations for seven years and requested anonymity because Apple does not permit staff to talk to the press. Customers are seeing waits of 30 to 40 minutes to buy something, she said, because the location is so short on staff: “We’re asking, ‘Can we hire more people? Because this is our busiest time,’ and they’re like, ‘We’re fully staffed. We’re doing great.’” An Apple representative said the company is actively hiring for US stores, and pointed to the thousands of open retail positions on the company’s job listing site. Another current employee, a full-time Genius since 2015, said even when stores are consistently overpopulated, workers debate with management for months over increasing head count. It can be hard to track how many customers are actually served, which determines staffing needs, according to this employee. Another Genius, who currently works at a mall store in New Jersey and is charged specifically with fixing mobile devices, said that for him, the 10-minute time limit is sufficient for troubleshooting most problems — but he underscored that the Genius Bar handles the “most irate customers,” who are often emotional, don’t understand technology fundamentals, or can’t remember their passwords. “There are moments where a manager will hover over your shoulder when you’re spending an extra five minutes on one of these customers,” he said. A technical specialist who moved from a longtime classic store to a newer location when Ahrendts started said Apple retail “now feels more like a Circuit City, a Best Buy. Those who work at the Genius Bar (or Grove) are also urged to make “one business connection a day” (up from one a week), according to one current Genius who has been with the company for three years. In addition to troubleshooting device issues, Geniuses now work to find out if their customers are small business owners or entrepreneurs, in order to flag them to the store’s on-site business team, which sells a special enterprise tier of AppleCare support, as well as mobile payment systems and other iOS- and Mac-optimized solutions. Ahrendts insists that she’s keen on extending benefits from Cupertino to retail employees, including the ability to move between stores and roles. She also told BuzzFeed News that nearly 400 retail employees move from retail into other positions at Apple annually, at the headquarters in Cupertino and elsewhere. But some said that their work is beginning to feel increasingly “corporate” under Ahrendts. A technical specialist who moved from a longtime classic store to a newer location when Ahrendts started said Apple retail “now feels more like a Circuit City, a Best Buy,” citing increased micromanagement, rising price of repairs, focus on getting people in and out of stores as quickly as possible, and a strong emphasis on attracting business accounts. Ahrendts addresses guests during the preview of the upgraded Apple Store on Regent Street on Oct. 13, 2016, in London. At 8 a.m. in Louisville on Sept. 21, the day before Apple’s latest products were set to ship, Ahrendts arrived to witness the “special sort” — a three-hour window at UPS’s massive Worldport facility dedicated solely to unpacking and shipping the new iPhones, Apple Watches, and Apple TVs destined for stores and customers’ homes. UPS is just one of Apple’s distribution partners, and Apple is one of UPS’s biggest customers. The haul was fresh off planes from China by way of Anchorage, Alaska. Once in the sorting area, pallets of iProducts are unwrapped and loaded onto conveyor belts. A security guard stands close by to ensure that everything does, in fact, get loaded. We watched as an unfathomable number of Apple device–shaped packages whizzed by. It was hard not to be impressed by the scale. While leaving the facility, I asked Ahrendts whether she misses fashion. She’ll always read Vogue, watch the Fashion Week shows, and buy the designs (“until they stop making clothes that I like!”), she said. “But the impact is bigger here,” she said, gesturing at the building processing all of the products that will end up in her stores. Last year, Apple reported “double-digit growth” in retail store visitors and revenue, while online sales reportedly grew 40% year-over-year, with $16.8 billion in revenue, ahead of Walmart, during that same period. According to Ahrendts’s most recent keynote appearance, there are also a lot of visitors: Over 500 million people visit its stores every year. This post has been updated to clarify iPhone preorders. An earlier version suggested that Apple sells more iPhones in a single night than during an entire weekend.